I’ve been wanting to get me one of these Air Hogs remote control vehicles for quite a while. For some reason, the kid in me just loves the idea of an RC vehicle that can literally drive up the wall. This spider car is able to accomplish this amazing feat with some sort of vacuum suction, and it can even drive on the ceiling, so I’m told. The company has taken another step in remote control vehicles by enabling them to follow a laser pointer. Have you ever had fun with your cat by making him or her chase the glowing dot from the laser pointer? It looks like this Air Hog follows the same principle. I’m not certain which is more fun. 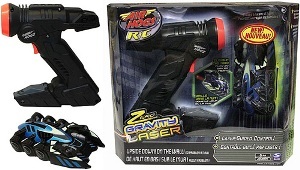 The Air Hogs Zero Gravity Laser will follow the laser beam without any emotion, simply because it is programmed to. The cat will go after that laser dot with personality and friskiness, and may or may not go after the laser pointer at all. Of course, your cat can’t climb walls or walk on the ceiling without damaging your house. If you want to try this out for yourself, the Air Hogs Zero Gravity Laser is available on sites like Toys “R” Us for about $49.95.